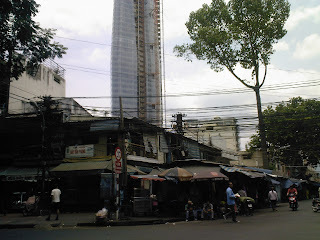 The skyscraper Bitexco Financial Tower with its 262 meters is the tallest building of Ho Chi Minh City (Saigon) and the second tallest tower all over Vietnam, only beaten by Keangnam Landmark Tower in Hanoi with a height of 336 meters. During the year 2010, Bitexco Financial Tower had the honor of being Vietnam ceiling, but that period of time was very short because in 2011 Keangnam Landmark Tower in Hanoi, conquered that title. In Vietnam this building is also known as Lotus building, due to its design, inspired by a lotus flower, a symbol for Vietnam. However, it has some resemblance with Burj al Arab in Dubai, I guess because of the heliport on one of the sides of the building instead of on the top of the skyscraper. This giant has 65 floors and 3 underground levels, all of them sum a total of 262 meters. It took 3 years to build it (from june 2007 to mid 2010). It belongs to a Vietnamese company, Bitexco group. Carlos Zapata studio in Nueva York was in charge of the design. The total cost of the project was 270 million dollars. The facilities of this tower are 16 elevators, which they say, they are capable of reach any level in less than 45 seconds. An heliport located on the 50th floor, an observation deck on the 49th floor (called Saigon Skydeck, with a unique view of the city, unfortunately the access is not free, the entrance fee is 200.000VND* *see Vietnam currency), a restaurant will be open on the 47th and 48th floor, a convention center from the 61th to the 63th floor, a shopping mall that will cover the lower levels and of course, offices. Bitexco Financial Tower, as couldn't be in any other way, is located on the heart of the city, Ho Chi Minh city district 1, on 2 Hàm Nghi street. These are some pictures of the skycraper of Ho Chi Minh City. A couple of videos of Bitexco Financial Tower, the tallest skyscraper in Ho Chi Minh City (Saigon) and the second skyscraper in Vietnam. Video of the surroundings and the main door to access the skyscraper. You can clearly see how they are still constructing the shopping mall in the lower levels. Light effects inside the observatory, in the 49th floor, any regular night in Ho Chi Minh City (Saigon).